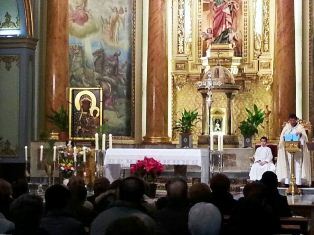 On Saturday evening, January 19, at 6.30PM, Our Lady of Częstochowa arrived in the Spanish town of Novelda, which is located about 30 kms from the city of Alicante, the capital of the province. The arrival of the Mother of God was accompanied by the bells ringing at the local churches. After the welcoming ceremony the Częstochowa Icon was carried into the church of St. Peter the Apostle and placed at the main altar. The Holy Rosary in the defence of life and family was said. During the prayers before the Icon, a small girl sang beautifully in honour of the Immaculate Virgin Mary with her splendid, angelic voice. Next the Holy Eucharist was celebrated. It was attended by around 300 people. During the homily the pastor of the parish explained the idea of the peregrination “From Ocean to Ocean” in defence of life and told the story of the Icon of Our Lady of Częstochowa. After the Holy Mass the people carried the Icon in a procession into the main square of the town Plaza se Espada and the Life Mobile left for the town of Villanueva de la Jara.